Fancy some wine tasting? The Glass House is the place to come! 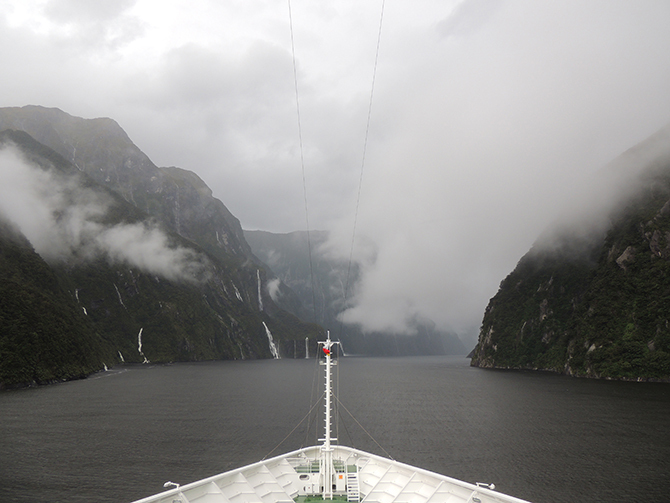 The height of the fjords was staggering! The iconic view which is a must see! Sydney Opera House was surprisingly smaller than I expected! In 2017, P&O Cruises will be celebrating 180 years of heritage. 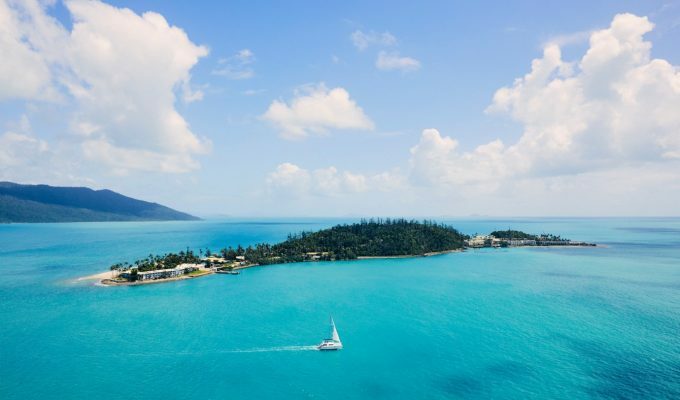 As part of the upcoming celebrations, Aurora’s world circumnavigation will be particularly poignant that year as she will be echoing the trade routes of the British Empire and visiting some of the world’s most iconic destinations. 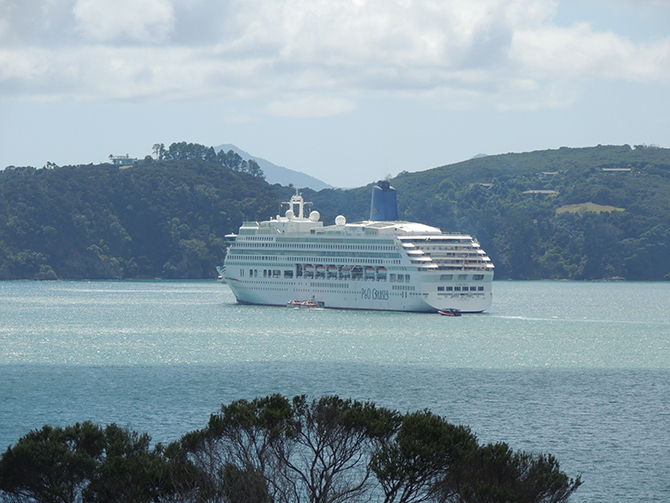 In anticipation of the anniversary in 2017, P&O kindly invited us to join Aurora on part of the 2016 world cruise from New Zealand to Sydney. 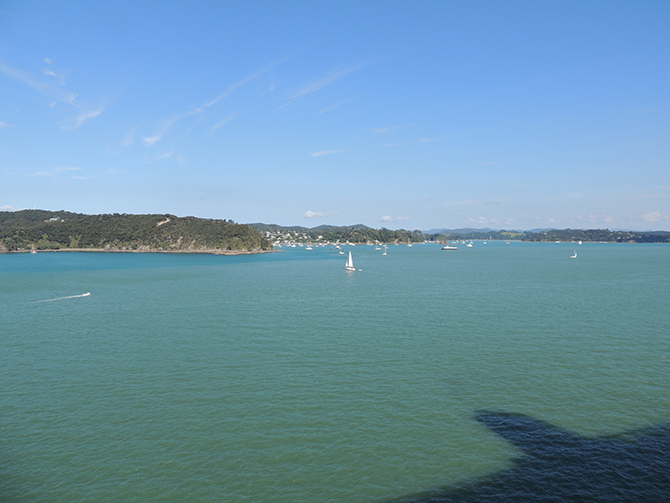 Visiting various ports in New Zealand, sailing through the stunning fjords and finally ending up in Sydney Harbour. Obviously, we couldn’t turn down this fantastic opportunity! 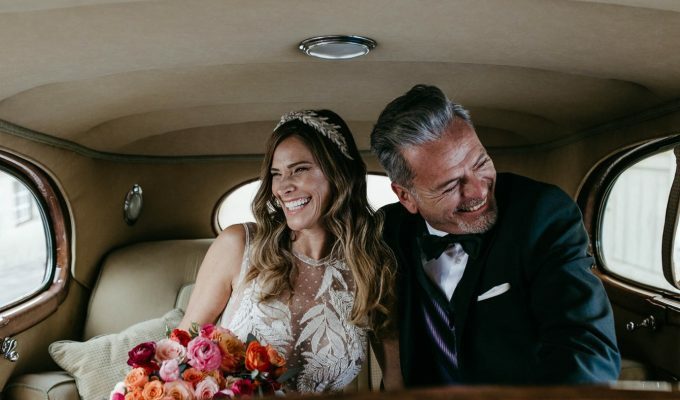 A cruise is a perfect honeymoon and combining it with a longer honeymoon ashore, it can make for an unforgettable experience. 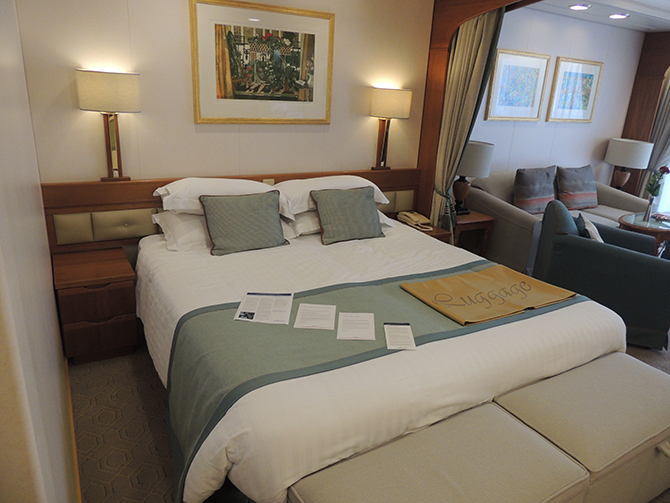 After a long journey from London all the way to Auckland, it was time to board P&O Aurora. As we drove up to the port you could see the ship towering over the nearby apartments. I checked in my luggage and headed through security and boarded the ship. 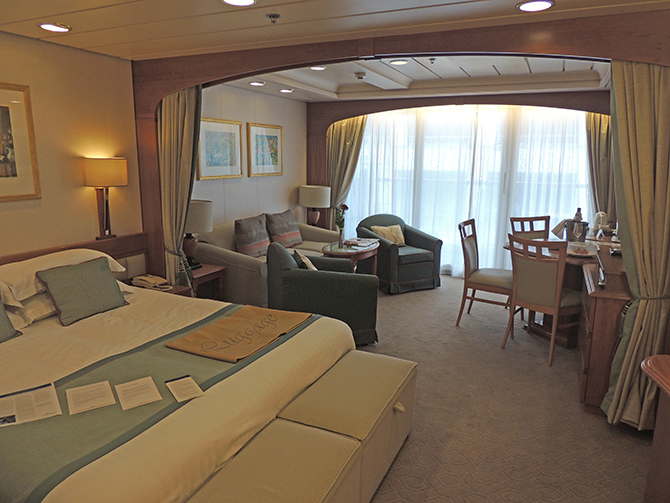 My cabin is a balcony mini-suite on deck 10. 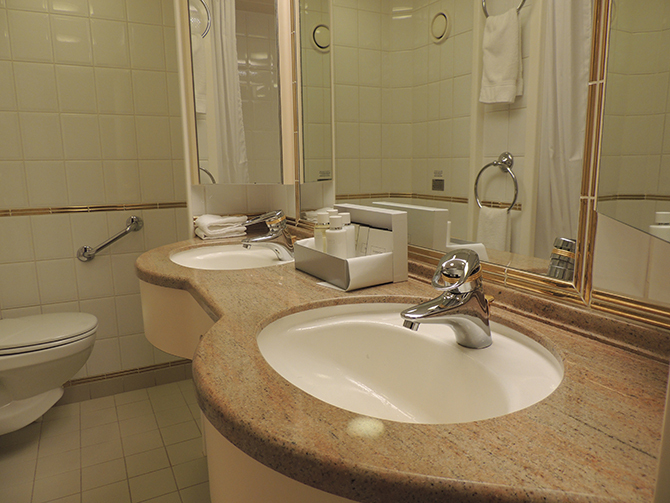 It’s a fairly large room with a jacuzzi bath and double sink in the bathroom. 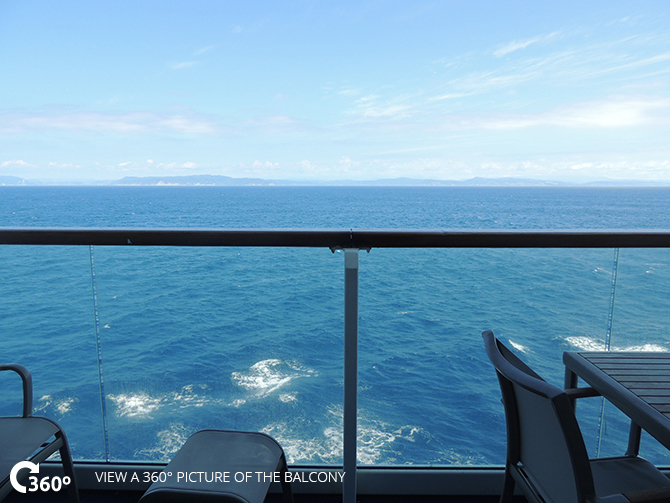 The balcony is spacious and includes a table, chairs and two sun loungers. Plenty of space if you fancy chilling out looking across the sea in private! In the lounge area is a sofa bed, desk, mini fridge, armchairs and a TV. In the bedroom area is a huge queen-sized bed, vanity desk and more storage than I have in my own bedroom at home! The room is of a neutral style with modern furniture and an extremely comfortable bed. After partaking in the emergency drill and unpacking my luggage, it was time I get to know the ship I will call home for the next 10 days. Considering this is my first time on a cruise, I was constantly comparing it to the Queen Mary which is moored up in Long Beach, California where I stayed last summer. I shouldn’t really compare it to a 1930’s ship, but it’s the best thing I could compare it against! Aurora is a mid-sized ship with a total length of 270 metres. 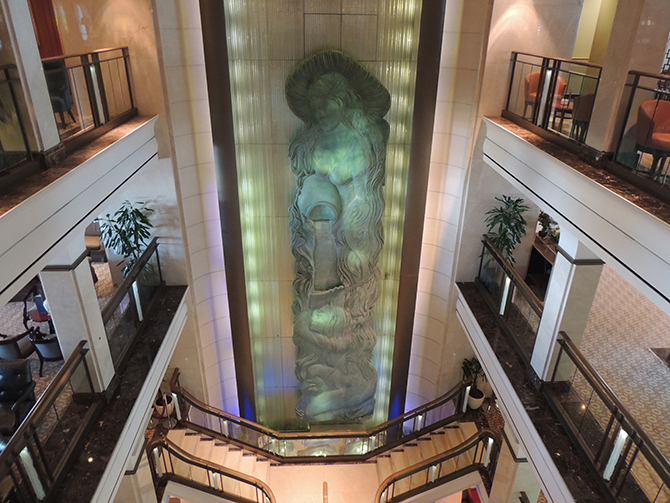 It features 10 bars, 7 restaurants, duty-free shops and entertainment venues. On most nights there is entertainment across the ship such as black tie balls, discos, movies, live music and many more different actives. 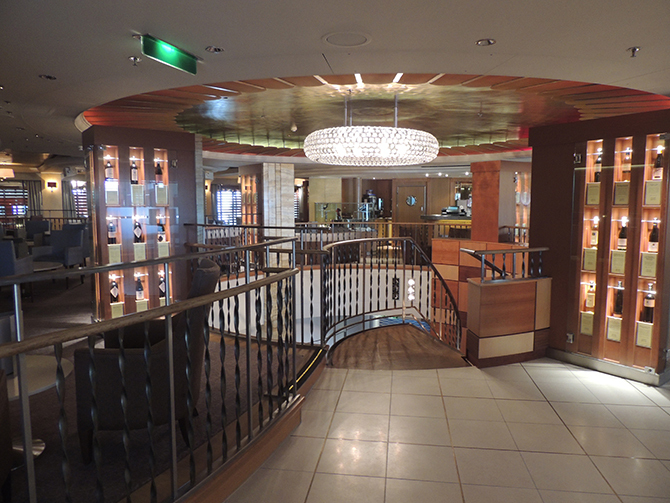 Entertainment and restaurants vary from ship to ship across P&O’s fleet. I was booked onto freedom dining which lets me turn up to the Medina Restaurant when I like and they will accommodate if a table is available. This restaurant is a fairly relaxed atmosphere with sea views either side. 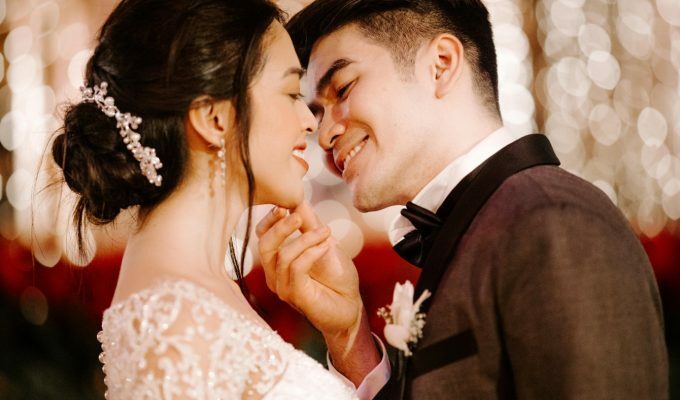 The service is impeccable, all the staff are friendly and very attentive. After ordering my meal the restaurant manager stopped by my table and provided me with a full vegetarian menu for the next night and said I’m more than welcome to pre-order from this. This made my usual 1 or 2 vegetarian choices on the main menu turn into 6 options! I have never (unless dining in a vegetarian restaurant) been provided with such a vast amount of options in a restaurant on sea or on land! Even so, the meal I chose from the main menu was delicious. After the meal, I headed back to my cabin to get to sleep suffering slightly from jetlag! After waking up at a ridiculous hour (body clock going crazy) I headed out onto my balcony and caught the sunrise. It’s a sight you don’t tend to experience from the sea. For breakfast, I went up to The Horizon restaurant. This is a buffet style restaurant open all day long and late into the night. 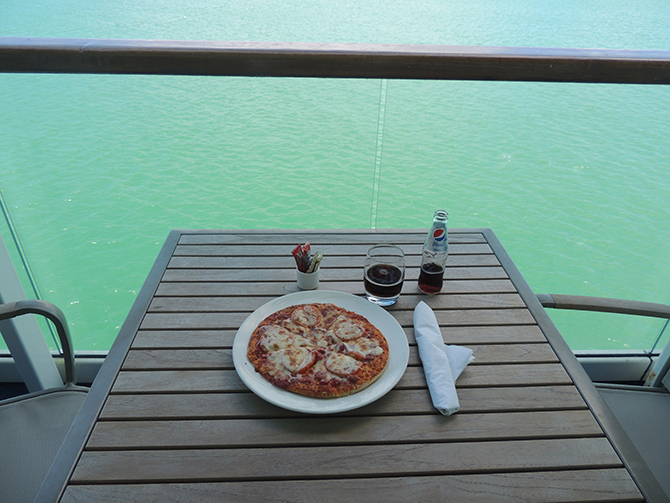 It’s a laid back approach to dining compared to the other restaurants on board. The choice for breakfast ranges from hot dishes, bakery goods, cereals and cold dishes. At 8:30 it was time to meet my excursion in the Curzon Theatre. After a short introduction, myself and around 20 others headed downstairs to the tender boat to take us ashore. 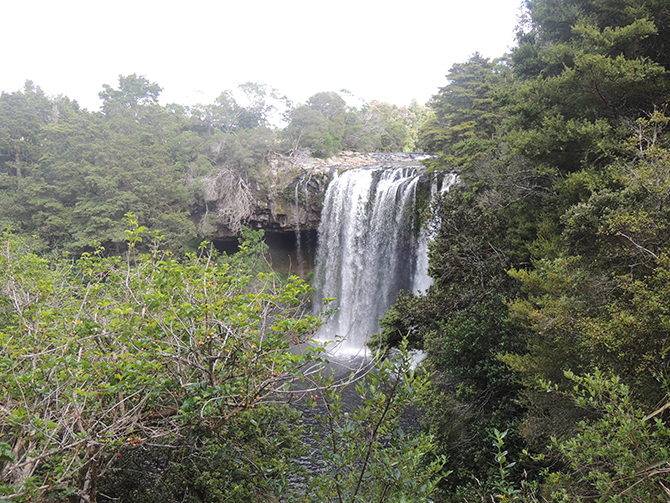 Upon reaching the port the coach took us to Rainbow Falls which is a stunning waterfall! 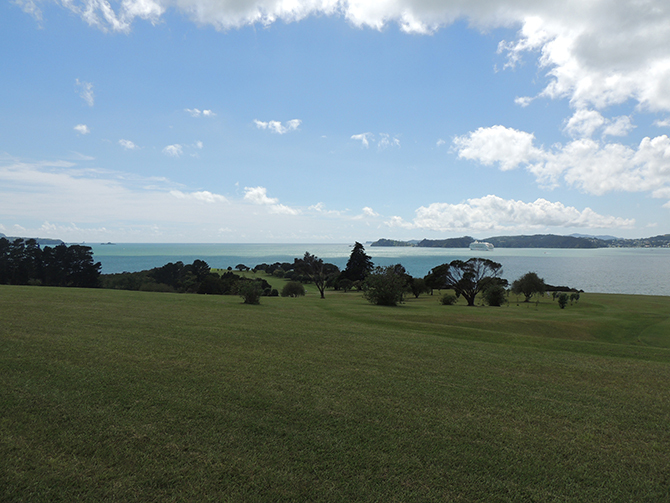 We then headed back down to near the coast and had a tour around The Treaty Grounds. This tour was extremely interesting, full of history of the local area. 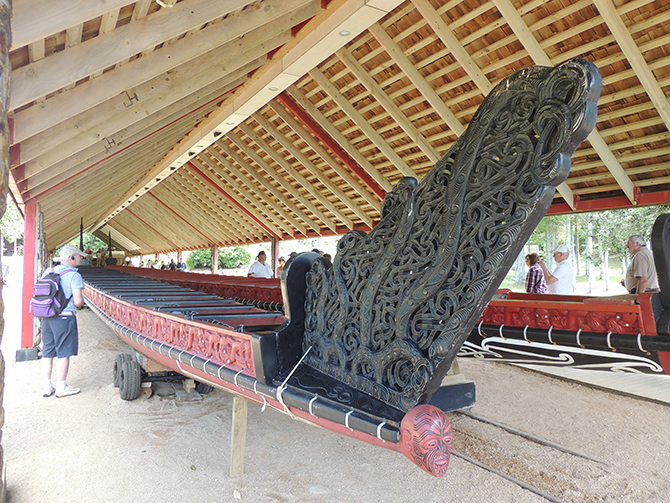 After the tour, we had the choice of getting the tender back to the ship or the free shuttle bus to the town centre. I headed back to the ship to get some lunch. I decided to order a pizza to my cabin and relax on my balcony. 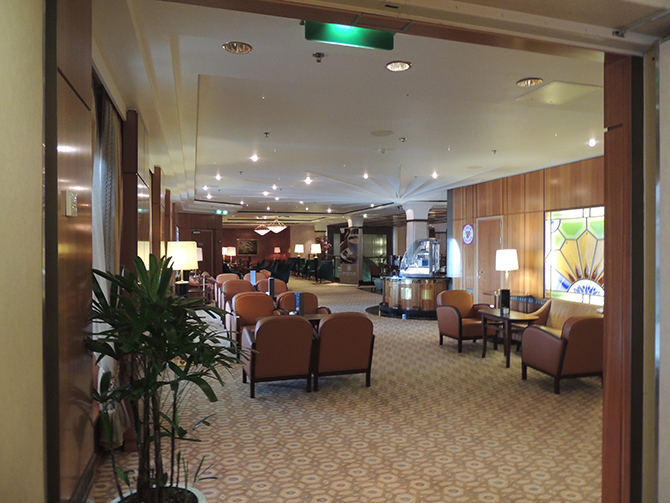 With so many places to be on the ship, there is always somewhere to grab a coffee and relax. 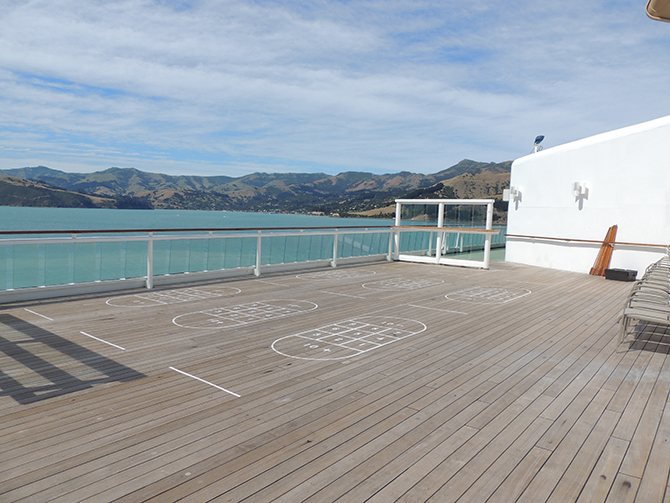 I spent the rest of the afternoon sitting on the terrace at the back of the ship. This area features a bar and a pool, so I could easily spend the whole day here! Towards the evening, I headed to The Crow’s Nest for a drink then back to the Medina Restaurant. Once again I was treated to a delicious meal and fantastic service. 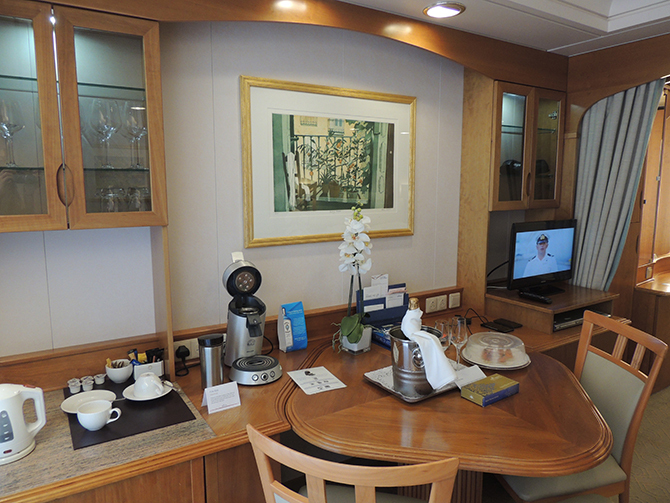 It is so nice to hear that the waiters and waitresses absolutely love working onboard Aurora. One of the waiters mentioned he had originally trained to be a Priest, but wanted to work at sea instead! Now that is commitment! After two days on board, I still hadn’t properly explored the entire ship. 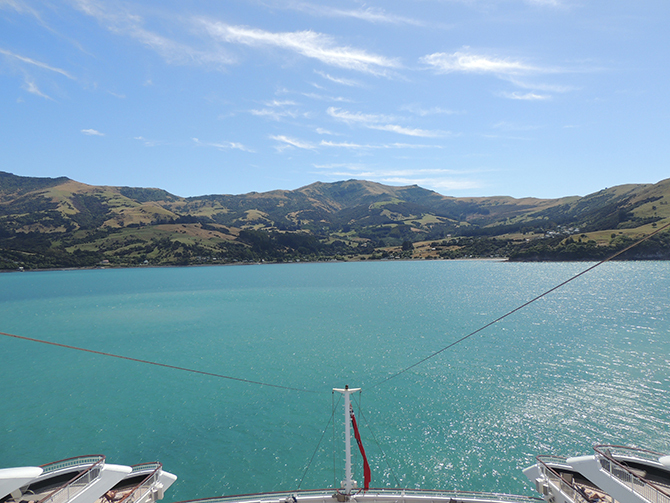 As today we were at sea sailing towards our next port of call, I thought it would be a great time to explore the ship. It was an extremely warm and sunny day so the pools and sundeck were full. I spent some time by the terrace pool relaxing in the sun. This evening I attended the captains welcome onboard party. It was a formal get together in the Masquerade with passengers and senior crew. With plenty of delicious champagne! After this, I headed to Sindu for dinner. This restaurant is new to Aurora with delicious Indian dishes designed by Atul Kochhar. This morning I was woken by the light streaming through the windows of my cabin. 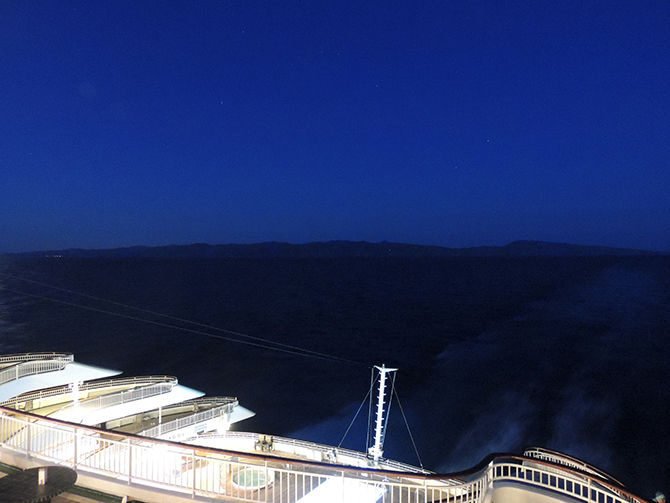 Shortly after having breakfast I watched Aurora dock in Wellington. It was a warm day with lovely sunshine. I disembarked Aurora and walked to the city centre. 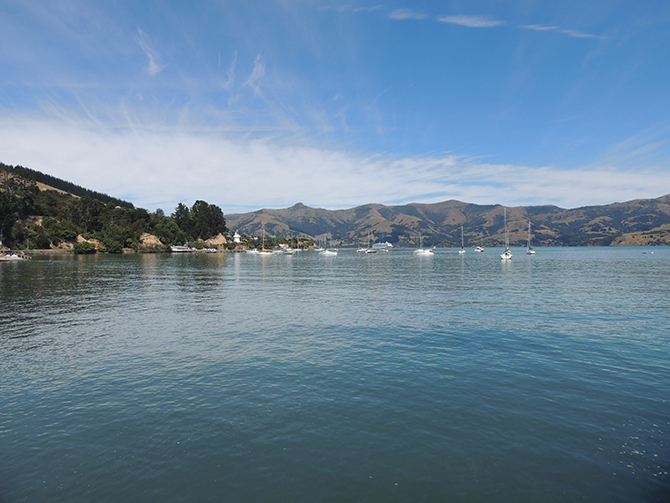 Wellington is the capital city of New Zealand and also the second most populous urban area. The city is a mix of old and new buildings. Heading away from the harbour I reached the shopping area. This is full of local shops and a mix of international brands. After a bit of window shopping, I headed down to the harbour which is full of restaurants and cafés. 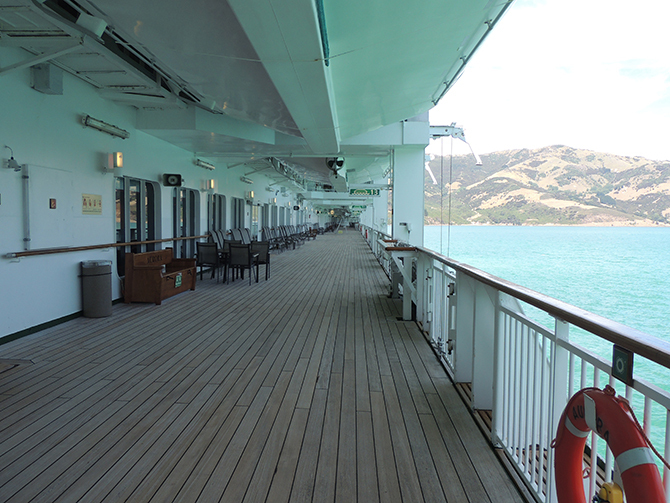 Once back on the ship, I noticed it was fairly quiet on the sundeck. I decided it was time for a cocktail and relax on a sun lounger for the remainder of the afternoon. I ended the evening with dinner in the Alexandra restaurant accompanied by some delicious wine. Honestly, the wine list is huge! 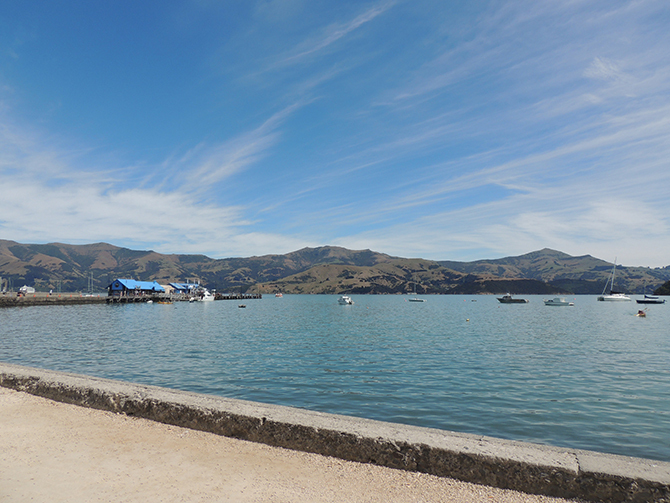 Today we arrived in the absolutely beautiful town of Akaroa. We docked just a 15-minute transfer from the ship to shore. 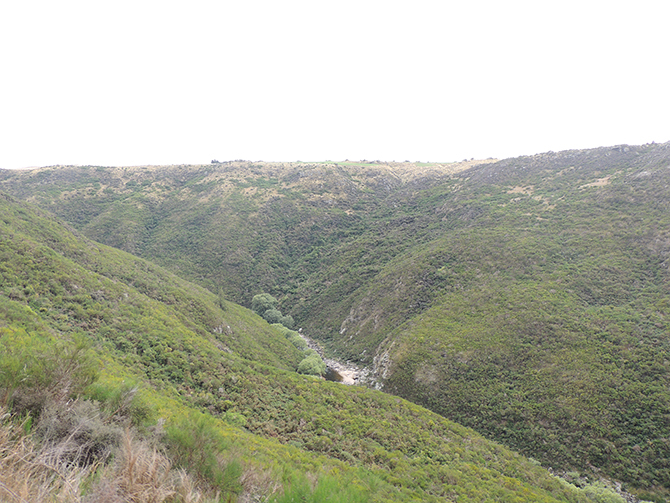 This little town is beautiful and overlooked by the remnants of a Miocene volcano. The town is extremely popular with tourists, in summer the population can swell from 570 to 15,000! 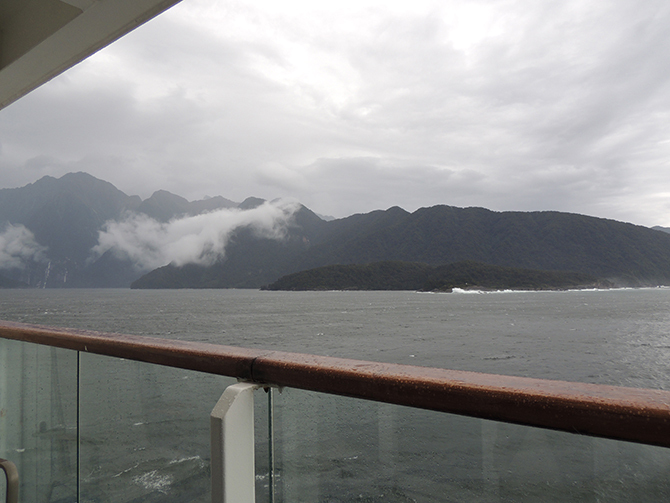 From the ship, I could see a stunning beach so made my way downstairs to the transfer. While onboard the transfer I met a couple who had been onboard Aurora since Southampton and they had been on this world cruise before. 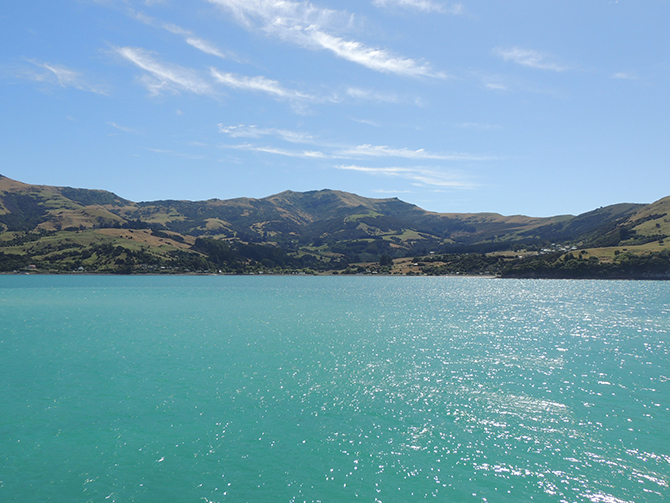 They had visited Akaroa on a previous trip so were very excited to go back! 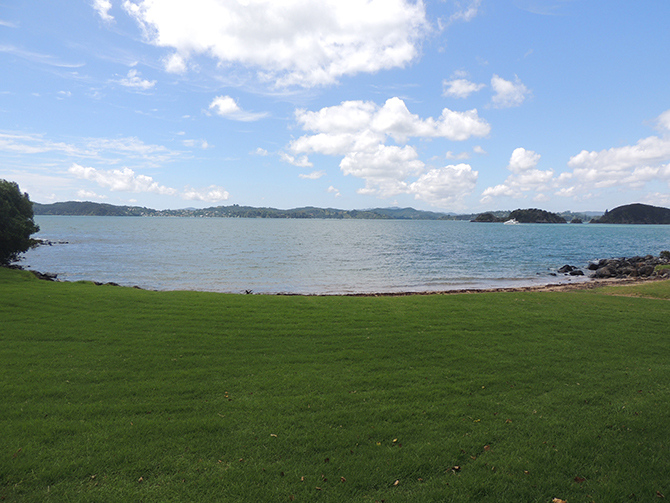 Once on the harbour, I walked along the road beside the beach. This was full of restaurants overlooking the pristine blue waters. As you can expect they were very busy today! 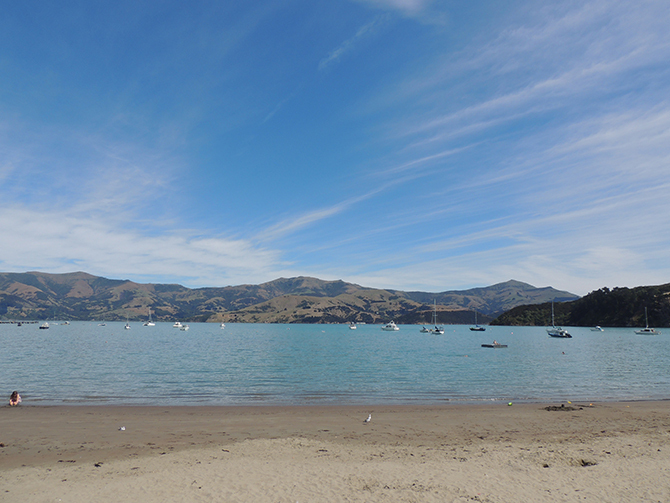 If you ever have the chance to visit Akaroa I highly recommend it! After spending a few hours in the town I headed back to the ship. I was a bit peckish so headed up to the bar beside the pool which offers takeaway lunches. Great if you’d prefer to sit elsewhere onboard! 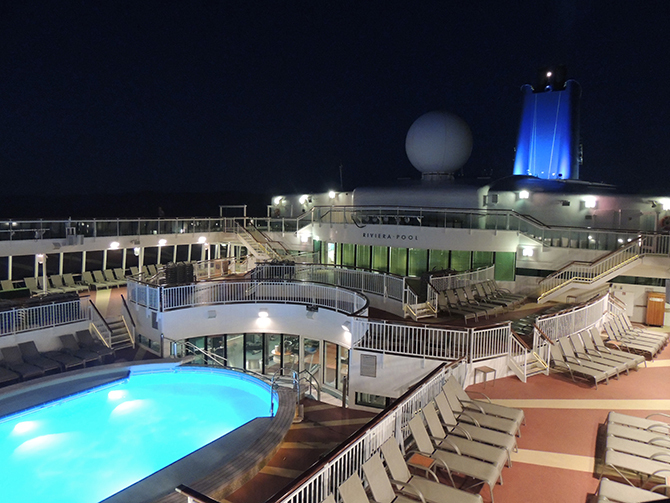 After dinner, I stopped by the bar and got a Mojito and wondered around the sundeck. 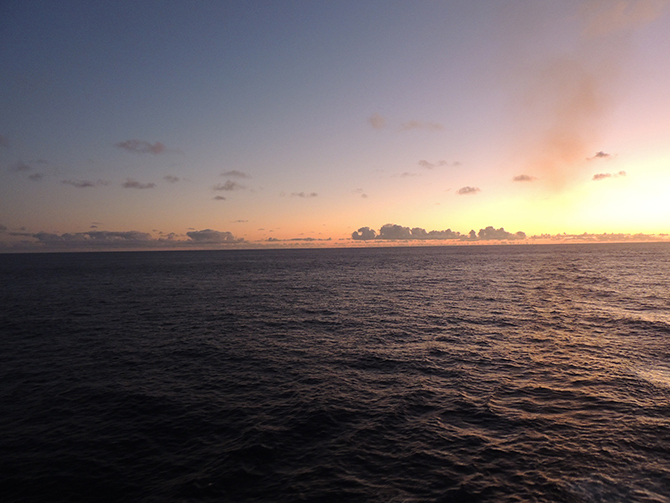 Considering we were already out at sea it was still very warm into the evening! I was very lucky to be able to see a night’s sky full of stars! This morning we arrived in Dunedin and I was up early to grab some breakfast from Horizon then head down to the Curzon Theatre. 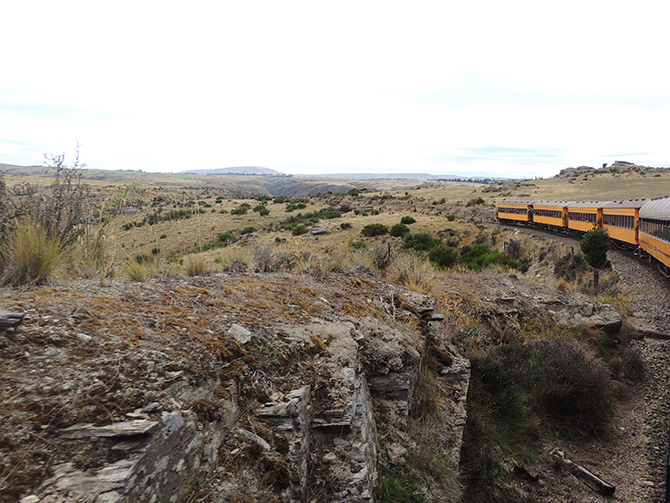 Today I had my second excursion booked which was a scenic few hours onboard Dunedin Railways’ Taieri George Railway. The train was waiting right outside the ship on the harbour. 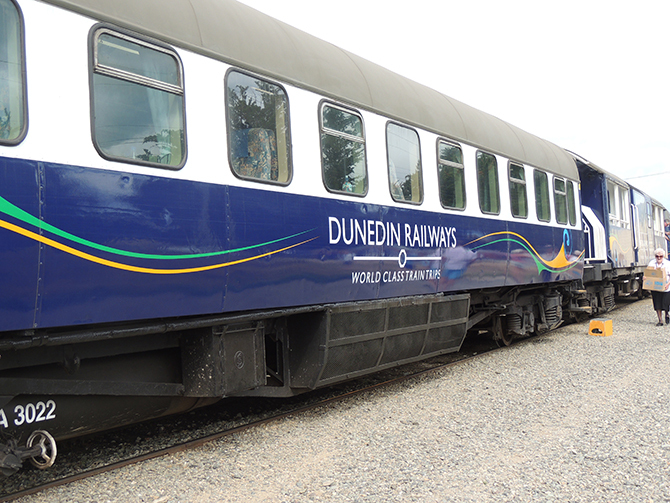 Some of the carriages on this train date back to the 1930’s! It really was like stepping back in time when boarding! 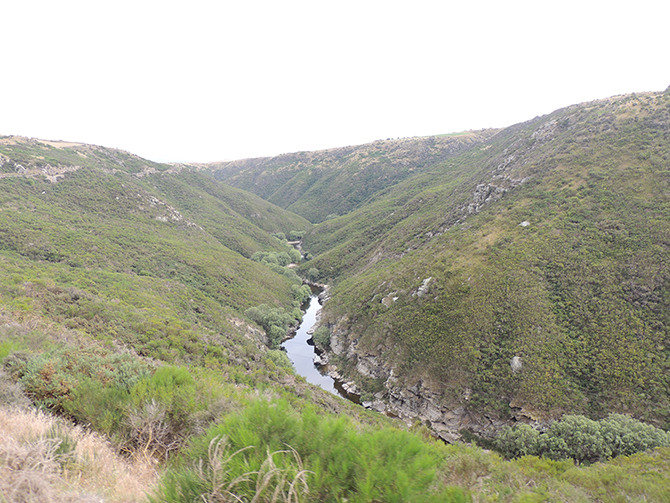 During the ride, I was able to walk down to one of the open carriages and take in the amazing views. 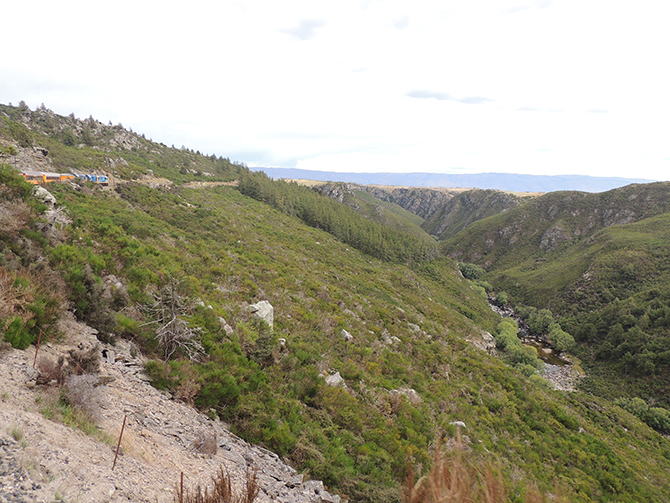 There were a few stops along the route enabling people to get off and look around. Once reaching the final destination the train headed back down towards the harbour, stopping in the town centre of Dunedin for 30-minutes. 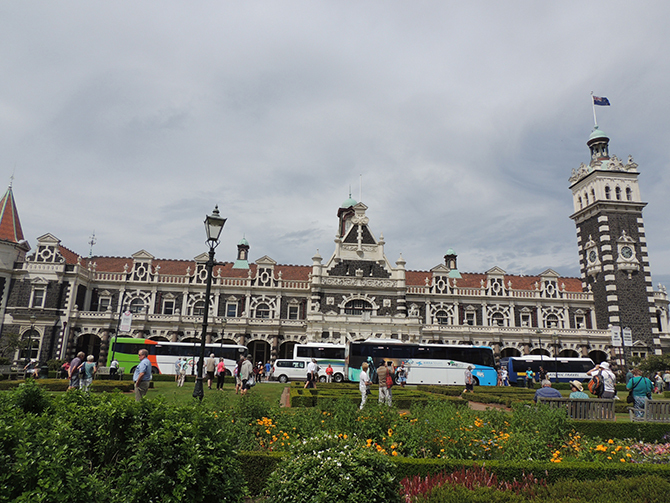 Dunedin is New Zealand’s first city, constituted in 1865. 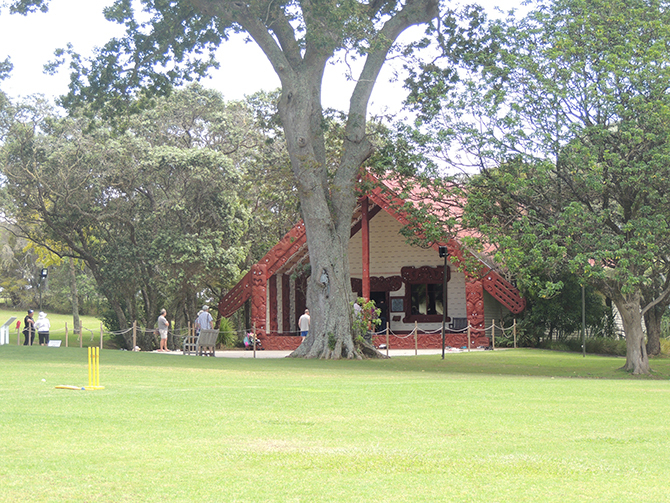 This city features New Zealand’s first university and also the tallest tree! 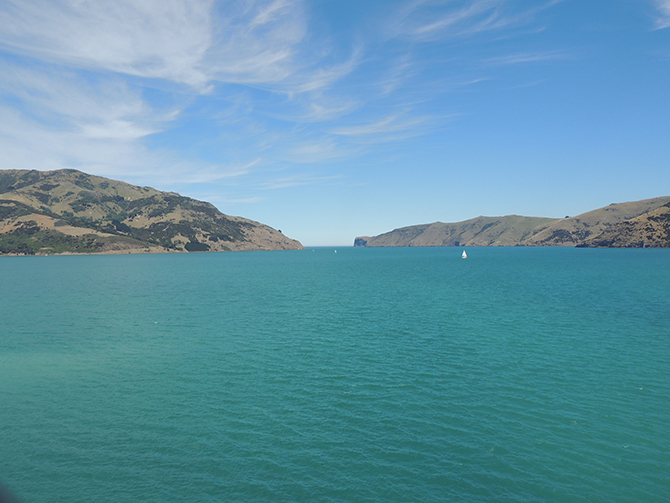 The name Dunedin is derived from ‘the hill of Edin’ in Edinburgh, Scotland. The Scottish influence is easy to spot in the architecture. 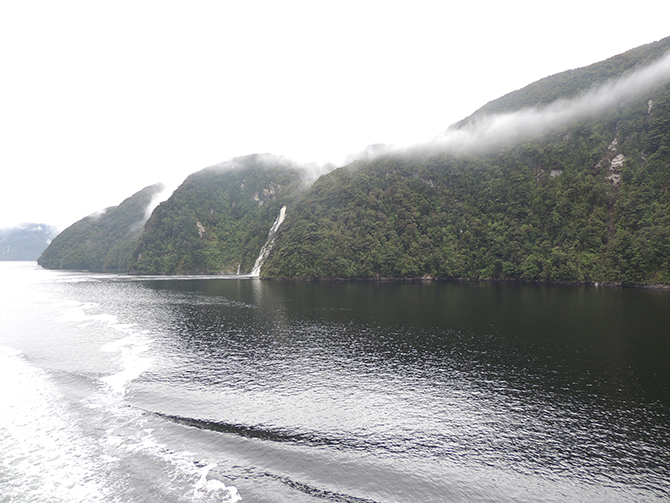 Today was the first of 3 days at sea however, today was very special as Aurora sailed through the beautiful fjords of South West New Zealand. It was an overcast day, low clouds and a bit rainy. This made for some very moody photos! 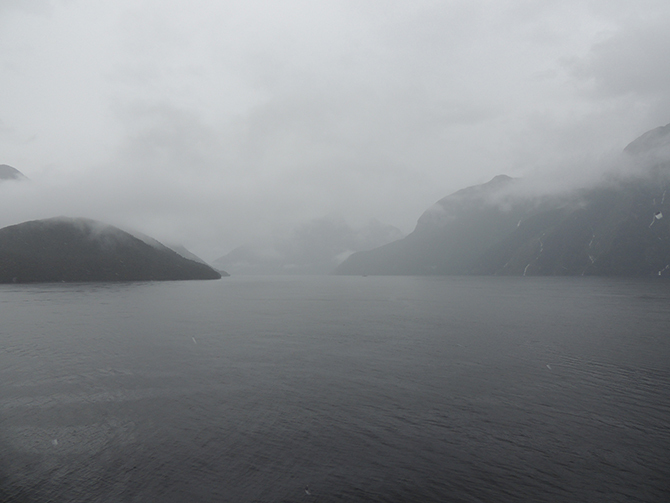 Aurora sailed through Dusky Sound and Doubtful Sound. On a few occasions, I managed to spot dolphins swimming beside the ship! 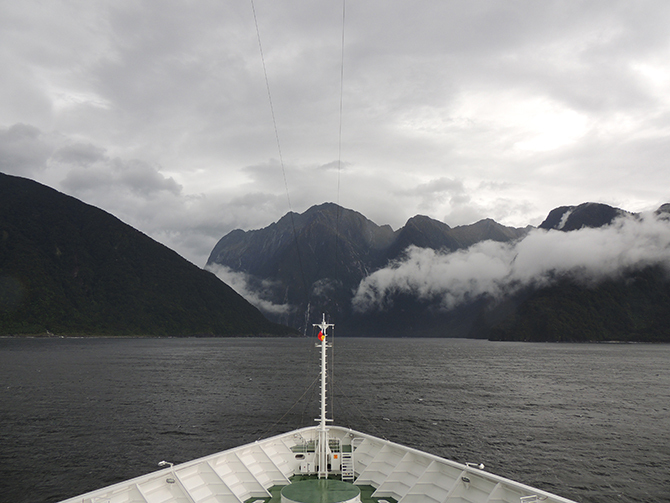 In the early evening, Aurora reached Milford Sound which was the last fjord to see. 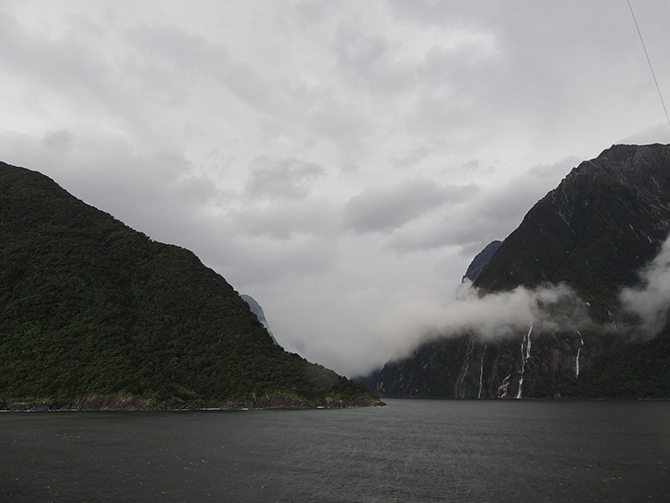 Milford Sound has been judged the world’s top travel destination and is acclaimed as New Zealand’s most famous tourist attraction. It’s easy to see why, it’s spectacular! 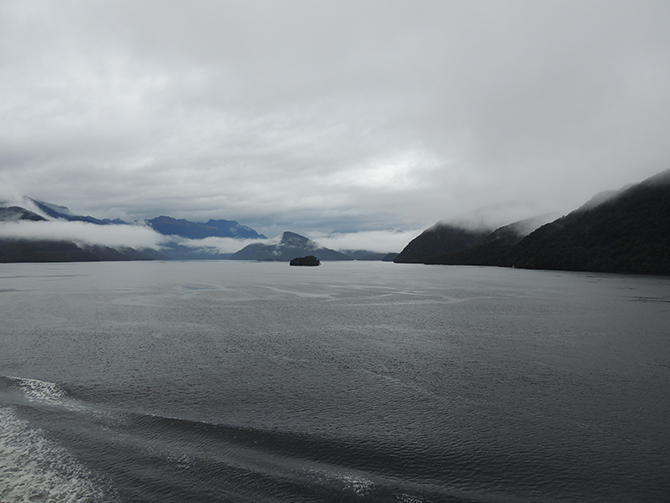 The mouth of the fjord is surrounded by sheer rock faces that rise 1,200 metres either side. 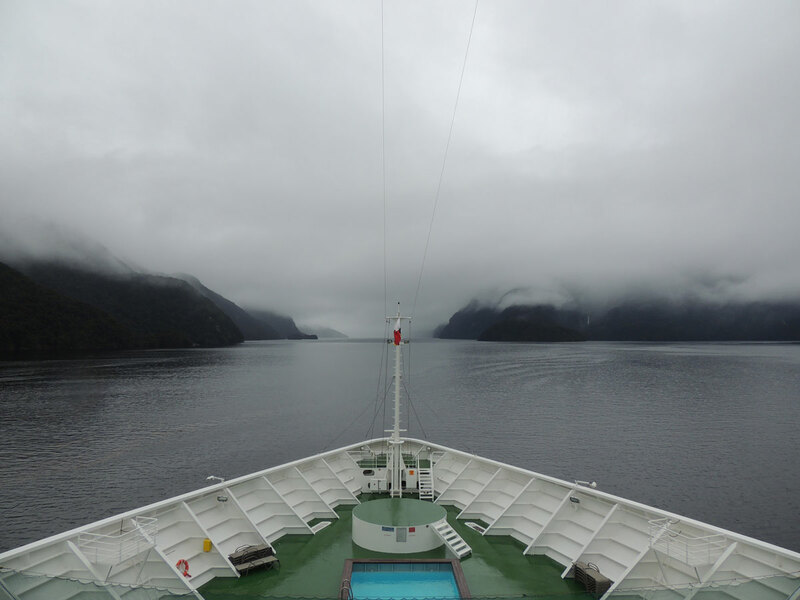 I managed to get a fantastic position right at the front of the ship to watch Aurora slowly navigate into the fjord. Once at the end of the fjord, Aurora turned around and made it’s way back out. 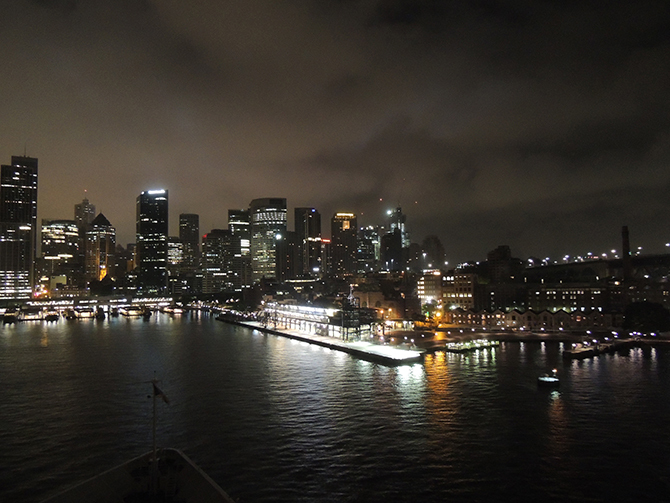 The next two days were spent at sea heading towards Sydney. This gave me plenty of time to relax and visit parts of the ship I didn’t have time to see. 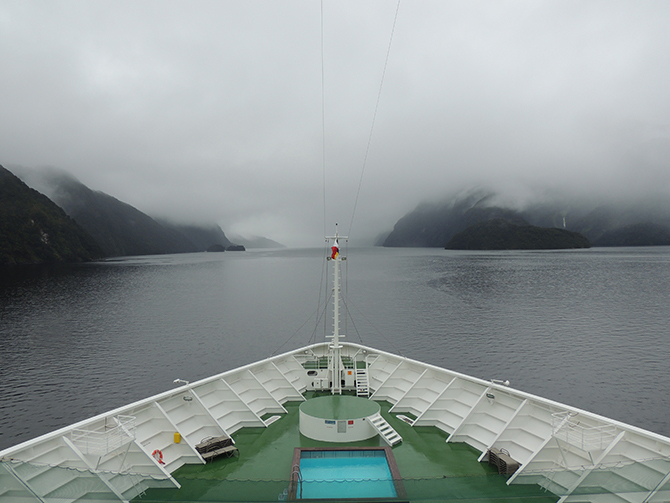 Unfortunately, the weather was against us and the sea was quite rough during this journey. I was just excited to arrive in Sydney! 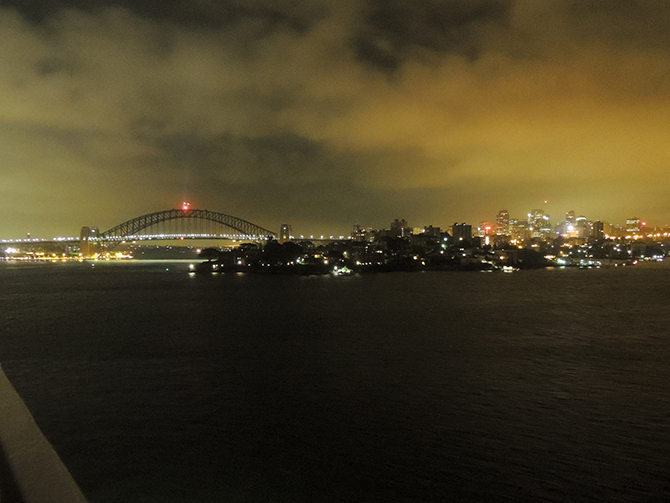 I woke up around 5am to watch the arrival in Sydney harbour. It’s a sight which I simply could not miss! 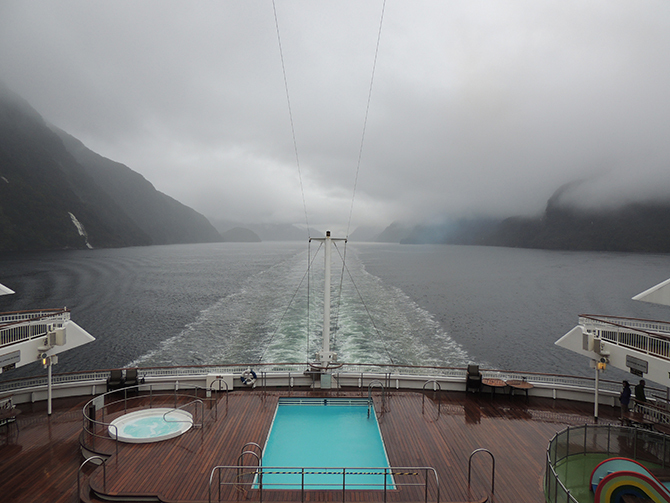 I headed out to the sundeck while Aurora slowly sailed into the harbour. 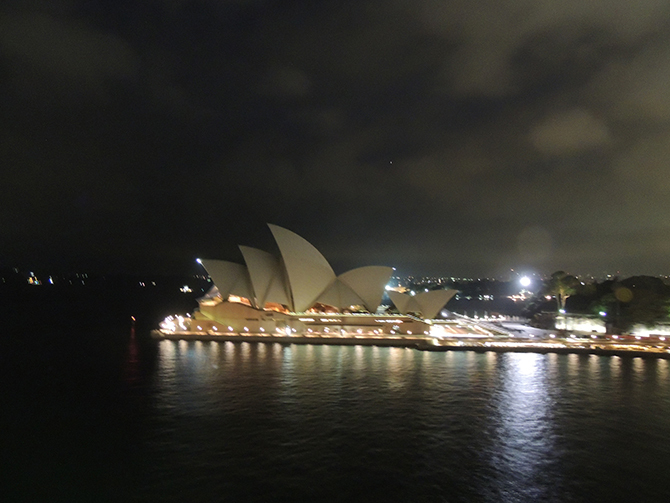 The top deck was busy with many passengers also watching this iconic arrival into Sydney. Aurora slowed right down in front of Sydney Harbour Bridge then slowly aligned parallel with it to approach the Sydney Cove Passenger Terminal. 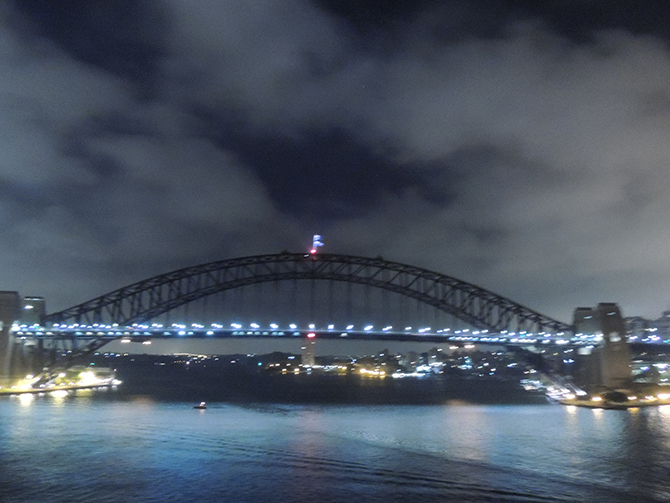 From this position, it was possible to see both the Sydney Harbour Bridge and Sydney Opera House. 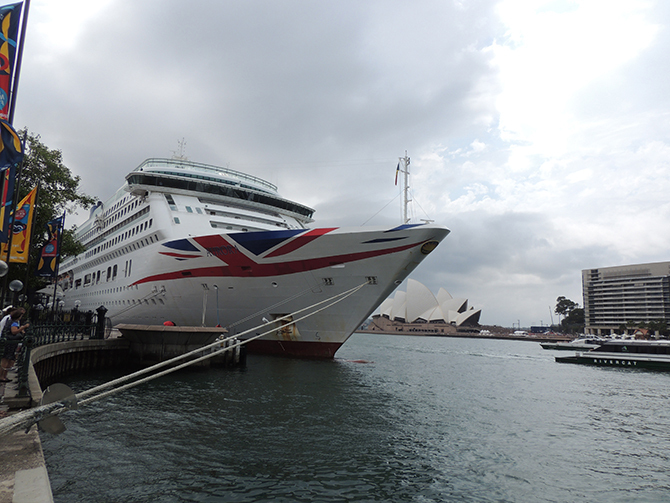 After all the excitement of arriving into Sydney Harbour, I grabbed some breakfast and shortly disembarked Aurora. Right beside the passenger terminal is The Rocks, which is a great must-visit destination. It has a famous market full of unique items, delicious street food and is the perfect place for gifts! After a few hours exploring the area around Sydney Harbour, I headed back to get my taxi to the airport. 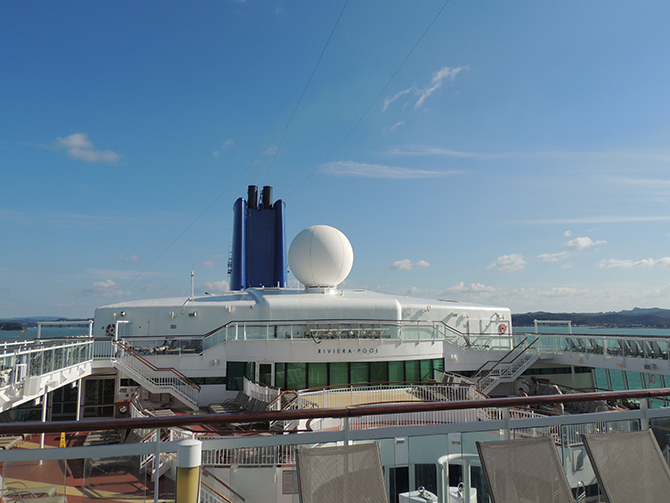 I had really enjoyed my time on board P&O Aurora and can’t wait to be back on another cruise soon!